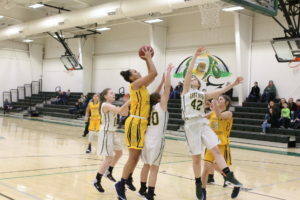 Moorefield and East Hardy Wrestling programs reached new heights with total team victories in the season along with the fastest pins plus conference honors at the Vikings Smash which featured 38 state ranked wrestlers in Petersburg last weekend. Moorefield Wrestling set a new program season record with 24 team victories coming against East Hardy on the second day of the tournament and extended the program best mark to 26 dual wins on the year as the Yellow Jackets won six times out of ten matches in Petersburg. “We wanted to eclipse our win total from last season and we also set a goal of qualifying more kids for the state tournament than last year. I am very proud of our kids effort, they work very hard,” Moorefield Wrestling coach T.J. Van Meter commented. 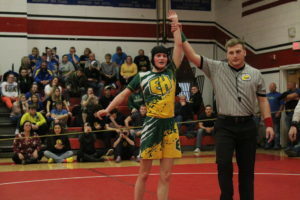 East Hardy Wrestling was victorious in four of their ten matches to create the most team wins in program history for a season with a total at ten victories. “The kids are getting better. Every year the kids are looking better and better. It is working out. It was really good competition here with a lot of state champions. It is a good tournament and it is close to home. We’re happy to be a part of it. We made good progress with decent records here. We’re not where we need to be, but we’re getting there,” East Hardy Wrestling coach Stevie Miller stated. Handing an opponent a loss in under ten seconds doesn’t happen too often, but at the Viking Smash Hardy County grapplers made it happen twice. Moorefield senior captain Matthew Wright (152-lb.) pinned East Hardy’s Conner White in just six seconds by locking his arms on the neck and using a pancake maneuver hitting the mat and tightened the half-nelson grip for the victory to earn the overall Viking Smash Fastest Pin award. “Getting the fastest pin award is something that you don’t necessarily set out to achieve. What I am proud of is attitude and mind-set that a wrestler must have to get a quick pin – fast, aggressive, and looking to take care of business. That’s what we preach to our kids,” Van Meter noted. Last season, Wright made a pin in six seconds with a duplicate move and was bested by another wrestler with a five second count for the fastest pin. “It feels pretty good, because I did the same exact thing last year. I pinned a guy in six seconds. I faked a blast double and snapped him into a pancake and a half-nelson. I got six seconds, but another guy had five seconds. I thought I had it in the bag this year, up until the last match when my coach was telling me about a guy getting five seconds yesterday. They called my name and I couldn’t believe it. 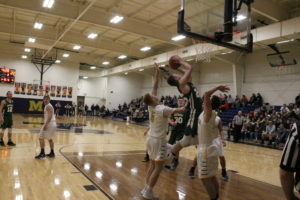 It was a great feeling,” Moorefield senior Matthew Wright remarked. East Hardy sophomore Dayton Miller (182-lb.) created a pin in eight seconds during a match against Elkins using a bear hug move and arm lock for the pin. Moorefield Wrestling had three grapplers selected to the All-Potomac Valley Conference Wrestling Team: Ty Clayton (freshman, 145-lb. ), Matthew Wright (senior, 152-lb. 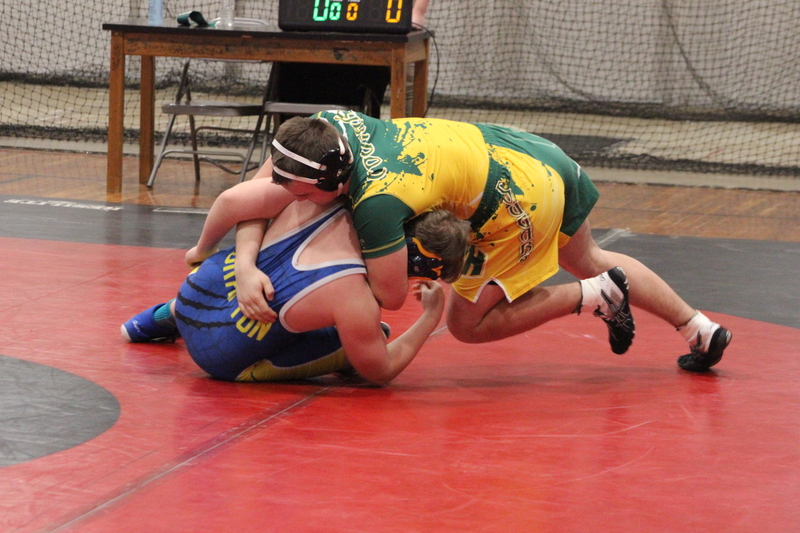 ), Isaac Van Meter (sophomore, 170-lb.). This was a new school record having three wrestlers named to the All-PVC Wrestling team as the Yellow Jackets only had one grappler in any given season prior to this year. Van Meter went undefeated at the Viking Smash as the 170-lb. champion, Clayton was the 145-lb. runner-up and Wright placed third overall in the 152-lb. division. Van Meter holds the record for the most single season victories in school history, tying his own mark this weekend of 57 wins at the Viking Smash which was set last year during his run to third place at the state tournament. Wright hit the 50-win plateau, Kevin Wetzel is over 40 wins and Ty Clayton joins Matt Delawder in the 30-plus club. East Hardy sophomore Hunter Ames (220-lb.) finished third overall in his weight class at the Viking Smash with a 7-3 record. East Hardy sophomore Dayton Miller (182-lb.) was 8-2 overall, but missed out on the ceremony honors since losing to Fairmont Senior as a team, despite winning his match. Van Meter was one of the 38 state ranked wrestlers on the Viking Smash card as the second best grappler in his weight class in Class AA-A and faced another top-10 wrestler for that class in Petersburg with No. 10 Philip Barbour’s Logan Allen going toe to toe entering the second period before Van Meter created a cross-face cradle for the pin at 2:41. Van Meter wrestled against Class AAA No. 3 Gage Albrecht of Hedgesville and won by pin at 2:55 in the second period and No. 5 Chris Fagga of Hampshire and won by pin at the 0:25 mark of the first period. One of the biggest match victories for Wright was against Class AA-A fifth-ranked Tyler Mason of Keyser battling to a 6-3 decision. There were a dozen teams competing at the Viking Smash as Petersburg hosted: Moorefield, East Hardy, Keyser, Frankfort, Hedgesville, Philip Barbour, Elkins, Grafton, Hampshire, Berkeley Springs and Fairmont Senior.